It appears that major subduction zone quakes around the ring of fire occur more or less every five hundred years or so. In fact it should be treated as inevitable. There may be specific locales that are generally immune for one reason or another, but that also appears to be the exception. All this means that the local problem cannot be ignored. The good news for the North West is that the urban areas have a large slice of rock between themselves and the natural epicenter. On top of that the exposed coastal zone is lightly occupied. What is needed though is the mapping of exclusion zones in which insurance is mandatory and prohibitive. We watched 200,000 die in Sumatra and saw towns disappear. The same risks exist for the mouth of the Columbia river. In a couple of generations the only structures in such a zone will be strictly those that are necessary. The key point is that we now understand the risk and understand its inevitability. We also understand that the events are associated with serious tsunamis. It is now criminal to not pursue remedies at the policy level. The solutions are even easy over the long term. I have watched vigorous earthquake resistance building codes been steadily adopted here in Vancouver over what must now be two generations and that captures everything simply because of the normal cycle of renovation. There is little in the way of cast iron drain pipes out there either. Once recognized, ownership change usually triggers activity. My point is that a major rule set can be deployed over two generations. This is not perfect, but it is practical for this type of problem and those unaware become aware of the live risk. The same should be applied to areas vulnerable to storm surges. Once again, geology can confirm the risk if there is any doubt. Why common sense has not already dealt with this escapes me. 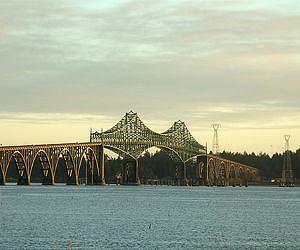 Structures such as the Coos Bay bridge are among the major infrastructure that will face risks when a subduction zone earthquake strikes the Pacific Northwest. (Photo by Lynn Ketchum, courtesy Oregon State University). A comprehensive analysis of the Cascadia Subduction Zone off the Pacific Northwest coast confirms that the region has had numerous earthquakes over the past 10,000 years, and suggests that the southern Oregon coast may be most vulnerable based on recurrence frequency. Written by researchers at Oregon State University, and published online by the U.S. Geological Survey, the study concludes that there is a 40 percent chance of a major earthquake in the Coos Bay, Ore., region during the next 50 years. And that earthquake could approach the intensity of the Tohoku quake that devastated Japan in March of 2011. "The southern margin of Cascadia has a much higher recurrence level for major earthquakes than the northern end and, frankly, it is overdue for a rupture," said Chris Goldfinger, a professor in OSU's College of Earth, Ocean, and Atmospheric Sciences and lead author of the study. "That doesn't mean that an earthquake couldn't strike first along the northern half, from Newport, Ore., to Vancouver Island. "But major earthquakes tend to strike more frequently along the southern end - every 240 years or so - and it has been longer than that since it last happened," Goldfinger added. "The probability for an earthquake on the southern part of the fault is more than double that of the northern end." The publication of the peer-reviewed analysis may do more than raise awareness of earthquake hazards and risks, experts say. The actuarial table and history of earthquake strength and frequency may eventually lead to an update in the state's building codes. "We are considering the work of Goldfinger, et al, in the update of the National Seismic Hazard Maps, which are the basis for seismic design provisions in building codes and other earthquake risk-mitigation measures," said Art Frankel, who has dual appointments with the U.S. Geological Survey and the University of Washington. This segmentation is reflected in the region's earthquake history, Goldfinger noted. "Over the past 10,000 years, there have been 19 earthquakes that extended along most of the margin, stretching from southern Vancouver Island to the Oregon-California border," Goldfinger noted. "These would typically be of a magnitude from about 8.7 to 9.2 - really huge earthquakes. "We've also determined that there have been 22 additional earthquakes that involved just the southern end of the fault," he added. "We are assuming that these are slightly smaller - more like 8.0 - but not necessarily. They were still very large earthquakes that if they happened today could have a devastating impact." "By the year 2060, if we have not had an earthquake, we will have exceeded 85 percent of all the known intervals of earthquake recurrence in 10,000 years," Patton said. "The interval between earthquakes ranges from a few decades to thousands of years. But we already have exceeded about three-fourths of them." The last mega-earthquake to strike the Pacific Northwest occurred on Jan. 26, 1700. Researchers know this, Goldfinger said, because written records in Japan document how an ensuing tsunami destroyed that year's rice crop stored in warehouses. How scientists document the earthquake history of the Cascadia Subduction Zone is fascinating. When a major offshore earthquake occurs, Goldfinger says, the disturbance causes mud and sand to begin streaming down the continental margins and into the undersea canyons. Coarse sediments called turbidites run out onto the abyssal plain; these sediments stand out distinctly from the fine particulate matter that accumulates on a regular basis between major tectonic events. "The turbidite data matches up almost perfectly with the tsunami record that goes back about 3,500 years," Goldfinger said. "Tsunamis don't always leave a signature, but those that do through coastal subsidence or marsh deposits coincide quite well with the earthquake history." With the likelihood of a major earthquake and possible tsunami looming, coastal leaders and residents face the unenviable task of how to prepare for such events. Patrick Corcoran, a hazards outreach specialist with OSU's Sea Grant Extension program, says West Coast residents need to align their behavior with this kind of research. "Now that we understand our vulnerability to mega-quakes and tsunamis, we need to develop a culture that is prepared at a level commensurate with the risk," Corcoran said. "Unlike Japan, which has frequent earthquakes and thus is more culturally prepared for them, we in the Pacific Northwest have not had a mega-quake since European settlement. And since we have no culture of earthquakes, we have no culture of preparedness. "The research, though, is compelling," he added. "It clearly shows that our region has a long history of these events, and the single most important thing we can do is begin 'expecting' a mega-quake, then we can't help but start preparing for it."